We are planning an event at work and it will involve ice cream. My job today was to head to the creamery and taste several different kinds of ice cream to see which I liked best and decide which we should offer at the event. It was an obviously stressful Friday. 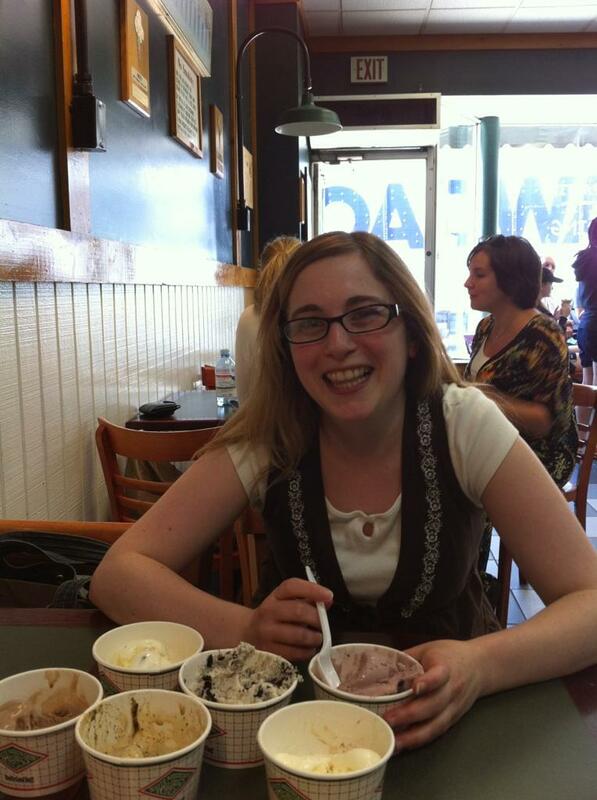 So my friend Sarah and I set out to White Mountain Creamery in Wellesley where we tried 6 different ice creams: coffee oreo, mint chocolate chip, holland chocolate, chocolate chip cookie dough, oreo frozen yogurt, and black raspberry chip. I’d never had black raspberry ice cream before, which is fairly hard to believe since I worked at Friendly’s in college (crazy, awesome, random, terrible job). I of course loved my usual ice cream favorite, coffee oreo, and my used-to-be-favorite-until-I-discovered-coffee-oreo, mint chocolate chip. After trying out a frozen yogurt (oreo, which was great) and a chocolate (because every ice cream party needs a chocolate, right? ), I geared up for the black raspberry chip. The owner of White Mountain Creamery told me it was pretty popular, mostly with women, and is one of the flavors that has been chosen for the event in past years. By this point we were pretty full, but I just couldn’t stop grabbing more spoonfuls of the black raspberry – I was really surprised at how much I liked it. I like strawberry ice cream alot (aside from those annoying frozen strawberry chunks), because I like the sweet fruitiness. I loved the black raspberry for the same fruitiness but was ecstatic that it didn’t have any annoying chunks. The chocolate chips added exactly the right chocolaty kick to the fruity flavor. Now, I don’t really see how black raspberry chip would work that well in a sundae – I think it would be the wrong flavor to be paired with fudge, peanut butter, or caramel and topped with Reese’s pieces or M&Ms, but in a dish or a cone, I think this might be my new favorite. What? You don't eat 6 ice creams when you go out?